Day 3 Food and… Fitness? I feel like such a fool even calling my so-called workouts “fitness”, but unlike most of the bloggers I follow, working out simply isn’t a big part of my life. It’s so unfortunate, but it’s just never been a part of my daily routine. I’ve had gym memberships and never used them. I’ve purchased workout DVDs and stuck with them for a few weeks, only to tire of the workouts and ultimately want to punch the instructors in the face at the very sight of them. I took dance classes and performed in musicals all throughout school (and I love all things Latin-inspired ;)) so I thought Zumba would be great for me. Again, I grew tired of it after a few classes. It’s safe to say that through my adult years, I haved tried just about every workout known to man and nothing seems to stick. About a month ago, I visited my grandmother in the hospital. She broke her hip and was preparing to have surgery. She was not well. Aggressive from the pain meds they had her on, I spent nearly two hours arm wrestling with her to keep her from pulling out all of the tubes she had in her. I left the hospital around 8 that night, came home, got Fielder, and went for a walk. A few minutes into my walk, cool air blowing against my face, finally processing the events of my evening, I started bawling. The reality that I may have to say goodbye to my beloved grandmother sometime in the near future had suddenly hit me and every emotion that I had bottled up inside of me came out and I just got this URGE to start running. So I did. And I cried. And I can’t even tell you how far I ran or how I somehow made my way back home, but I did it. Converse sneakers, jeans, and hoodie-clad. I’m sure I looked like such an idiot, but it felt SO good. From that point on, I decided to start jogging whenever I had the chance (note: I will only jog at night because this is totally me.) I went just about every night for the next week or so, increasing my distance little by little each time. Now I’m not going to pretend like I’m suddenly a marathoner or that I don’t take little walking breaks during my jogs, but for me, it’s progress. It’s something that feels good. I’ve had sort of a whirlwind of a year (heck, two years even), which has caused a lot of stress, both good and bad stress, and jogging has proven to be therapeutic for me. Fielder also loves the jogs, but with a wacky work schedule that sometimes doesn’t get me home until after midnight, we don’t always get to do our nighttime jogs. Though I’m not exactly sure what’s scarier about running outside post-midnight than pre-midnight?? However, I have been fitting them in a few times a week still. What I’m trying to say here is, this 20 Day Holiday Workout Challenge is truly a challenge for me. But I vow to cram some sort of workout into every week day until Christmas. I CAN do it. What I managed yesterday was a few of Tracy Anderson’s “Fit In 6 Minutes” workouts that I discovered on Pinterest. The latter was reminder #9 billion why I should ALWAYS stretch before any sort of workout. That booty tightening move KILLED my hip flexors! I’m not sure pumpkin spice coffee and a Luna bar constitutes healthy, but that was my breakfast. I got so much accomplished yesterday that it was time to leave for work before I even knew it. I threw together a quick salad to eat on the road. Ooops, pretty sure that falls into the same category as Texting and Driving here in Wisco, but I had such a busy day! 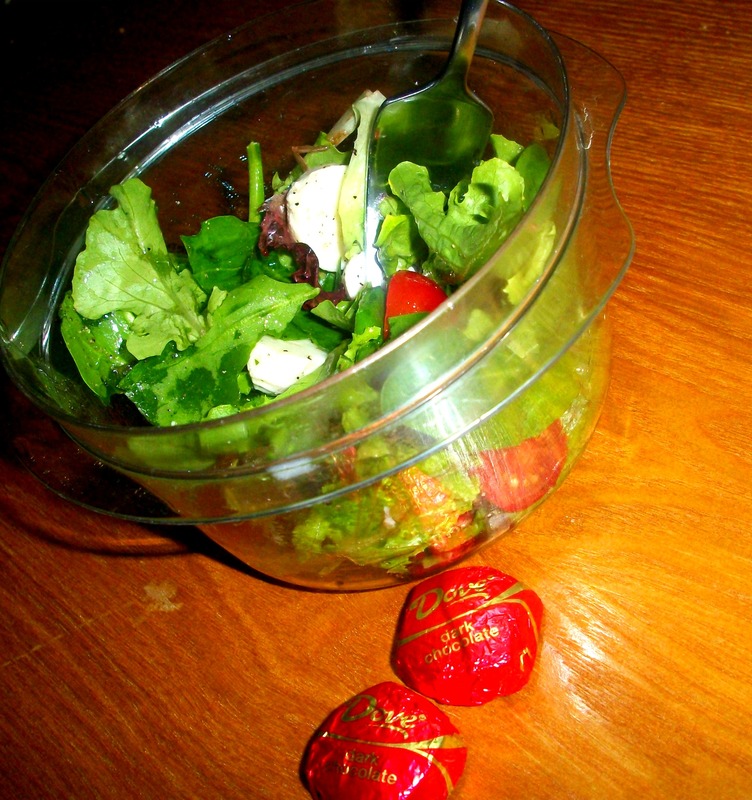 Anyway, my salad consisted of some spring mix, grape tomatoes, and the mozzarella balls that I have been OBSESSED with. 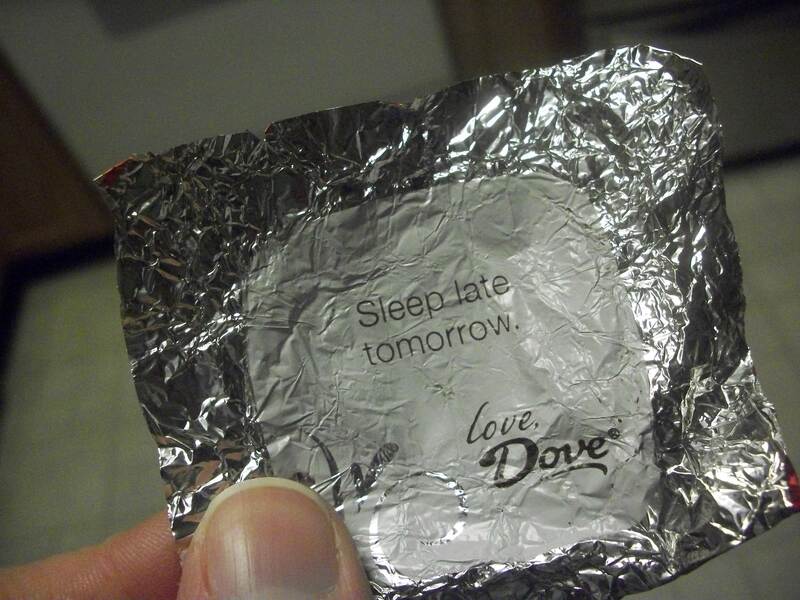 Plus a couple of Dove dark chocolate promises for a sweet finish. I used a splash of red wine vinegar and a splash of the mozzarella marinade for “dressing” and it was the perfect mix! I suppose this was my “linner” as I worked right through actual dinner time, but my boss did whip up a tasty “spicy pretzel boat” for a snack late last night. Who am I to deny the command of a Dove Promise?? In all honesty, I planned to wake up “early” this morning (I even set an alarm!) so I could make the most of my day. But before I went to bed last night, I made a mental checklist (one step closer to a to-do list!) of things that I NEEDED to get done today and things that could wait. The most important are cleaning up the house and baking birthday cupcakes(!) so I didn’t need to get up as early as I first thought. Plus, my shift tonight is a long one and I probably won’t get home before 3am so I figured I would laze about for a bit longer than originally planned. I’m pretty sure this is the longest post EVER so I promise I’m about done. I’ve got cupcakes that need to be baked! But on a sad note, my grandmother did pass away last Sunday and we buried her the weekend after Thanksgiving. I am so thankful for the wonderful memories I have of her and will miss her every. single. day of my life, but we had a beautiful service for her, complete with a 21 gun salute in honor of her days in the Marine Corps. I will blog about it, and her, sometime in the near future. Previous Post I need a to-do list.